Let me share with you a hidden treasure that took me a while to find! For a long time, even though I was using an expensive editing program, I was not getting satisfying results when upscaling SD video (i.e. VHS tapes) to HD. I sure am now! 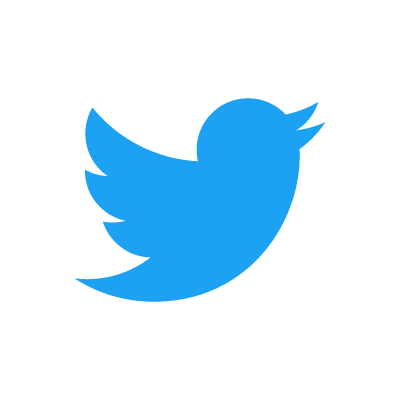 Note: If you are a competitor of ours, please, stop reading here. ;) It was thanks to Andrew Swan, a respected professional blogger writing in great detail about this subject, that I now proudly offer affordable, high quality HD up-scaling. If you're curious about the cost of our upscale service, please follow the link to our online estimator tool: cost for transferring and upscalling 10 tapes of 1 hour each. 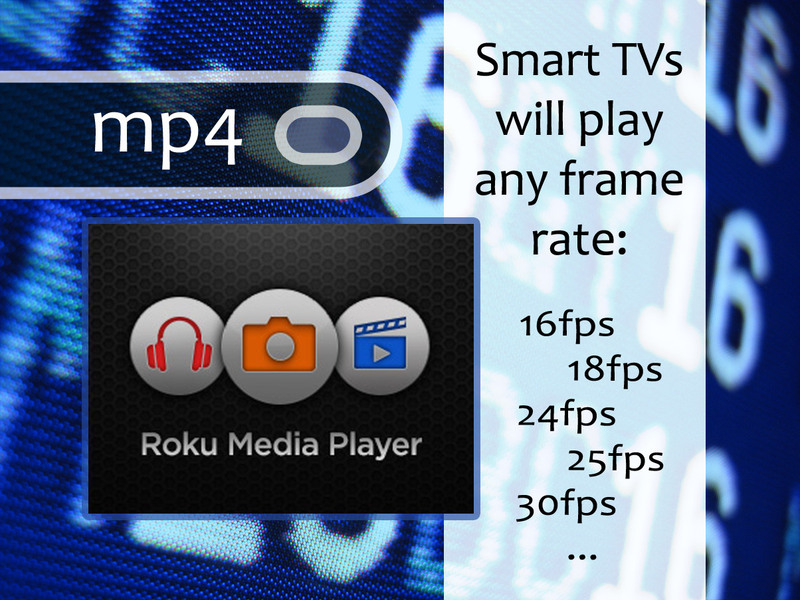 You may adjust the current numbers according to what you actually have in your video collection. Or, if you want to try your hand at "bumping it up" yourself, you can follow Andrew's instructions, below. A few things to keep in mind, before you start. It takes quite the investment in time and electricity! 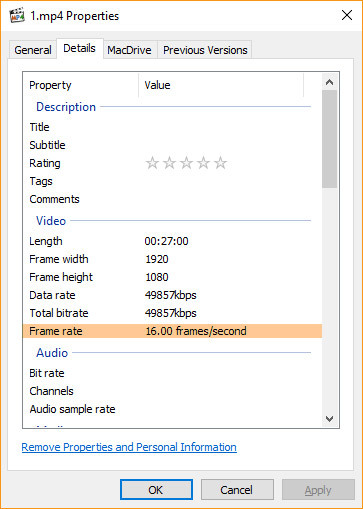 Expect a 1 hour tape to take 3 hours worth of processing time -- and that's on a speedy computer. My office gets warmer, even with my water-cooled computer, as it processes away on these files. Ah, but the results are so well worth it. Andrew Swan has been blogging since 2008 about video processing. In his 45 minute YouTube video here, (sorry he since removed the video from youtube - the link is now going to a different video) he explains how to use AviSynth and all the required filters to properly de-interlace and upscale your SD video files to HD 720, or full-HD 1080. He'll walk you through all the steps of downloading, installing, and processing an SD video file. Before starting, it's a good idea to prep your files. Clean up the start and end times of your initial capture (file) by editing out the "snowy" parts. Bring the glaring whites and deep blacks into a more pleasing viewing range. Pay attention to the color intensity in your highlights and bring those down a bit in order to bring about a more natural looking result. Now that he files are cleaned up a bit, it's time to upscale. 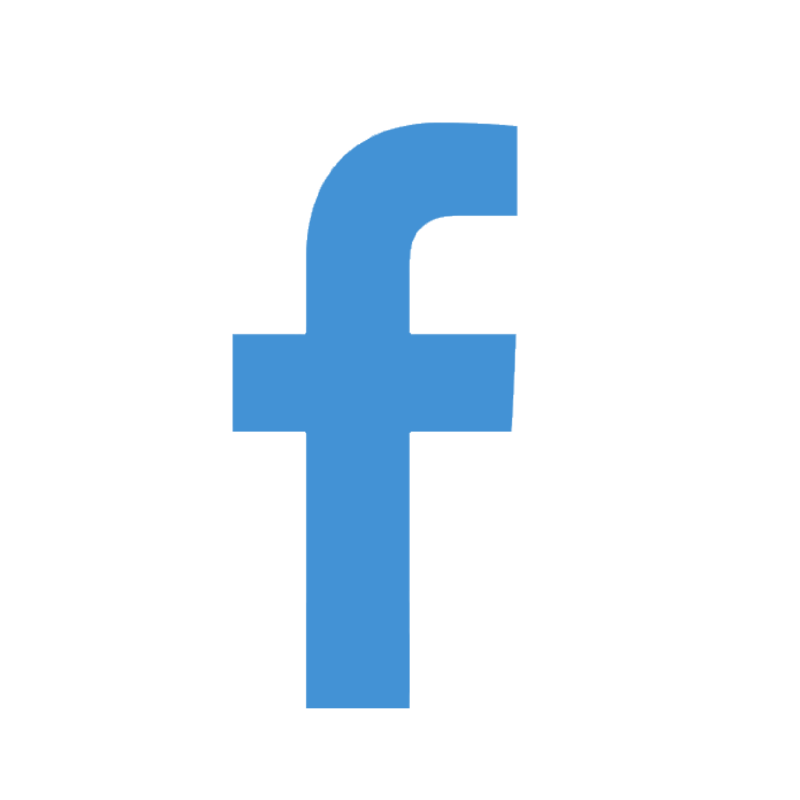 "I had some free time, and I created a high quality frame capture of your conversion, the same frame from the other company conversion, and a merged version where I show how their scan only covers 40% of the actual image you captured (i.e. they lost 60% of the frame). I selected 2 different frames where it’s impossible to recognize the people, and you are welcome to use these in your website if you like (please do not use the others). 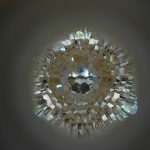 I think it highlights the quality you offer pretty well." 1st transfer performed by the other company. Here the two transfers are overlapped. Theirs is inside and ours is the outer edge. See the beautiful colors we were able to restore? At FilmFix we capture the entire frame from edge to edge. 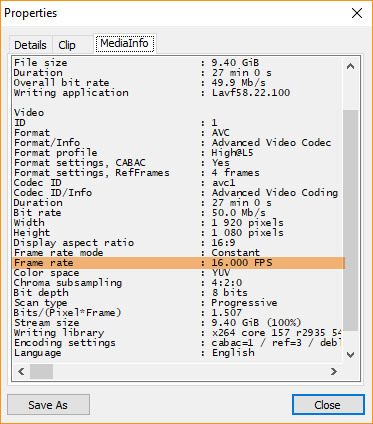 Because of our superior 10-bit capture, when a film's colors are challenged, we are able to improve them to a large degree with the "secondary color correction" image enhancement option. And, when a film was over-exposed or under-exposed, we can improve that to a large degree as well with our added option of "secondary color correction." Our FilmFix transfer -- We capture the whole frame, from edge to edge. By overlapping our transfer and theirs, you can better see what is missing in their work. Their image is muddied, the colors are completely off, and their image lacks crispness. You'll note that the grass on the outer edge of the above example is not very crisp. This is because "grain reduction" was applied to the transfer. "Grain reduction" has advantages and disadvantages. It gets rid of many scratches and imperfections, but it does tend to slightly soften the image. 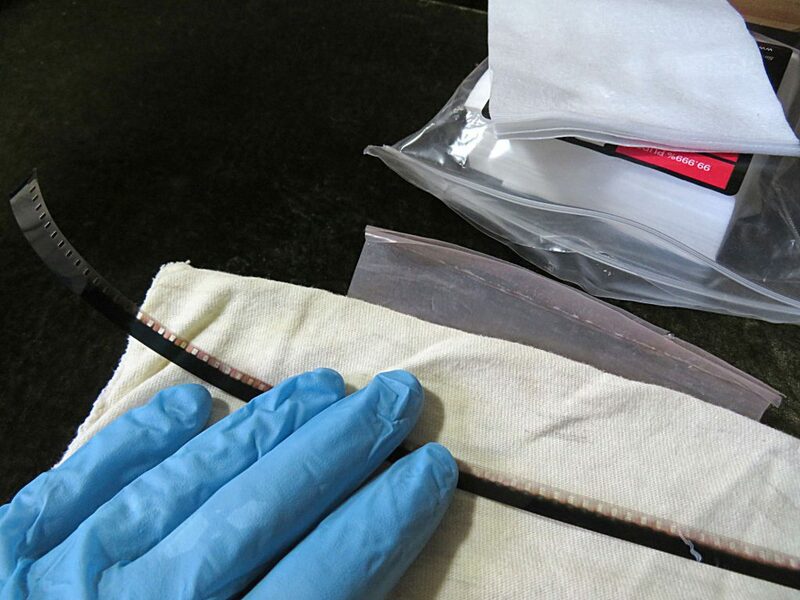 That's why when a customer chooses "grain reduction", we like to provide their transfer in two files -- before and after -- grain reduction was applied. (So, check that box on the order form if you want both versions.) The two files will require a bit more data storage, but it's very rewarding to have both versions of the final footage. Customers love it! We are sorry to see some of the shoddy work that is being done in this industry. It does nothing for the industry's reputation. While we always enjoy restoring our customer's films, it is such a pity to learn they've wasted their time and money elsewhere before finding us! Nicole's challenge and sweet-stuff for us! FilmFix got a nice mention on the Nicole Sandler Show this week, but because of her network's policy, she was not allowed to indicate our company's name. Listen to how cleverly she handled that! It's sweet and made us smile -- broadly. Additionally, it gave us goosebumps, because being acknowledged like this has a way of touching the soul. "Psst" .... Laura (co-owner of FilmFix) even speaks for a few moments in the middle of this brief clip. Please have a listen! FilmFix doesn't use a Wolverine for transfers, but if you don't know what's on your family's treasured films, you can rent a Wolverine from us for a couple of weeks and have a look! Knowing what you have, before sending it off, is a nice way to organize your collection. Then, we can professionally transfer your precious memories in 2K resolution to obtain the best possible full-HD (High Definition) outcome. We'll put your transfer either onto a Blu-ray, USB stick or hard drive or a combination of your choosing. We can also put it on a DVD, but that only holds a lesser quality "Standard Definition" transfer. Note: Operating the Wolverine does require a little technical know-how. YouTube has helpful videos, and we include a copy of the "User Manual" with the rental. It's $80 to rent for 2 weeks. You pay shipping, both ways, and fee varies depending upon where you reside. We are located in Ojai, CA and ship out via USPS "Priority Mail" with a "Signature Confirmation." A $300 refundable deposit is required and is returned to you once we receive the machine along with its accouterments, in fine working order. Shipping fees range between $12 and $45. Wolverine MovieMaker-PRO 8mm and Super 8 Converter - new $400 / we do not sell. If interested in a rental, please fill out our FilmFix Wolverine Rental Agreement and send it to us as an attachment via email, or 'snail mail' works too. Since we were receiving multiple inquiries asking, "Do you use a Wolverine?" to perform your transfers, we thought we had best know what type of transfer the inexpensive machine delivers. So we bought one -- their better model! The results are markedly different. The effort a customer needs to put forth to use the machine is also markedly different than a customer utilizing our 8mm transfer service. Details about our professional 8mm transfer equipment Clearly, we offer our customers beautiful film transfers by attaining all that is possible from any given film. We offer the additional image enhancements of "image stabilization", "secondary color correction" and "grain reduction", if a transfer calls for it. Plus, our customers have repeatedly noted our great customer care, and it shows in our stellar customer testimonials (dating all the way back to 2005.) We hope you don't hesitate any longer ... those memories are fading off the films stored in a box in the drawer or closet. See Mother Nature, shining brightly, in this fine footage! The camera work of these two clips was exceptional. Thank you, Mr. Commons, for letting us use this as a sample transfer on our website. Clip courtesy of Mr. Spencer Commons, with expressed written consent -- All Rights Reserved. Maria was thrilled with what we achieved on her small 3-inch Test-Transfer reel. Therefore, she granted us use of fun parts of it on our website. 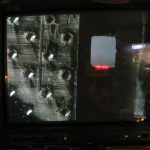 The Super-8 film was littered with tiny emulsion cracks. Originally, the multitude of cracks provided for a very hectic viewing experience. So, we used our additional image enhancement option of grain reduction to remove these cracks as best we could. 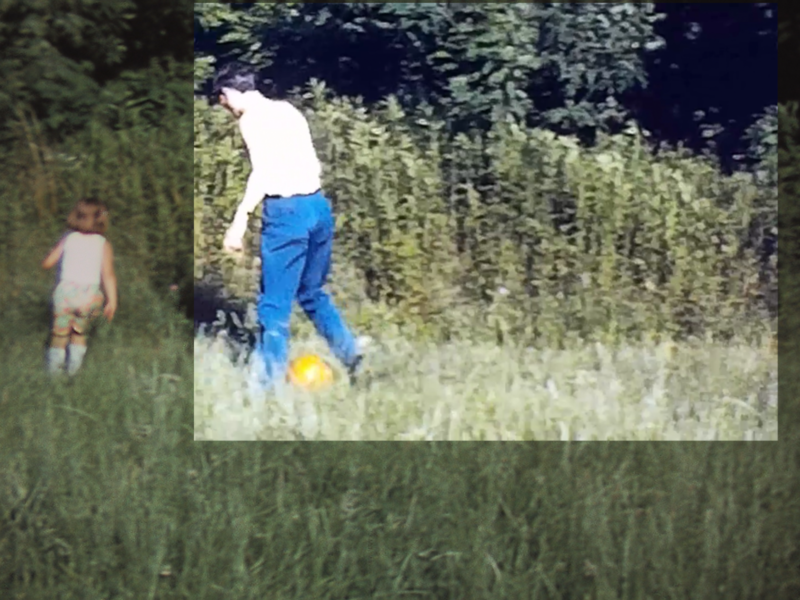 We also restored some of the discoloration by means of our secondary color correction work. 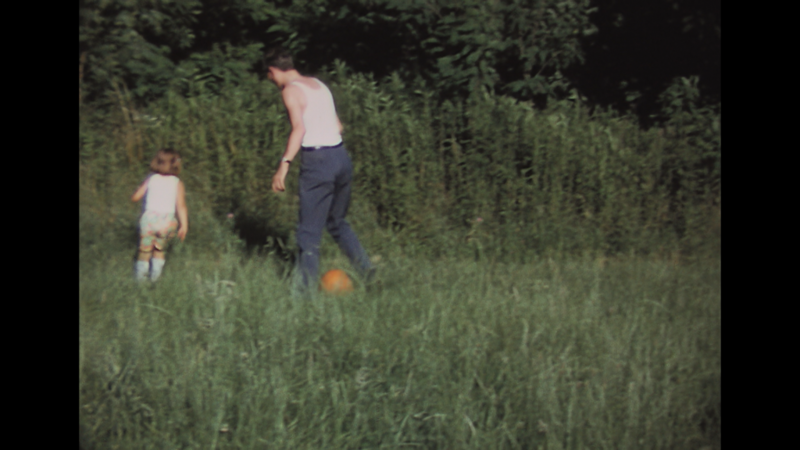 The film had turned a strong magenta, in color, and had lost its yellow color layer. 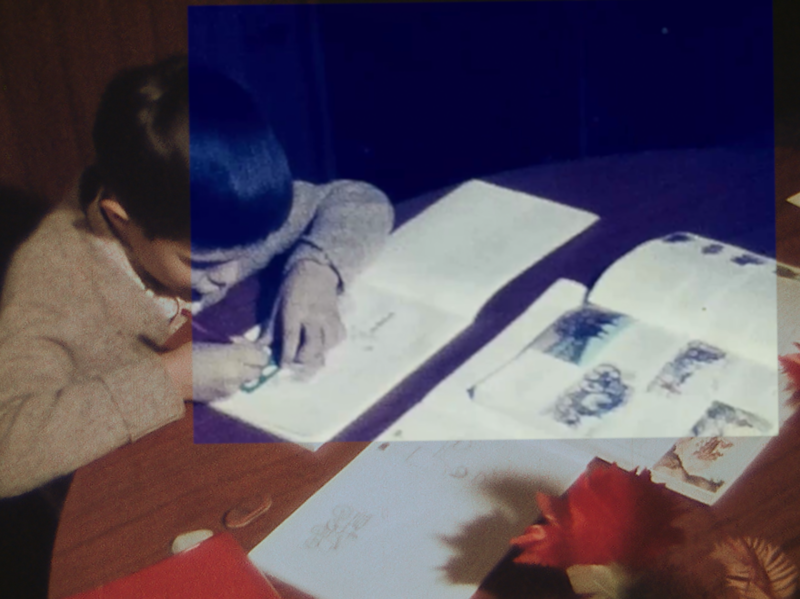 The result: The film looks more natural. Clip courtesy of Maria Ikenberry, with expressed written consent -- All Rights Reserved. 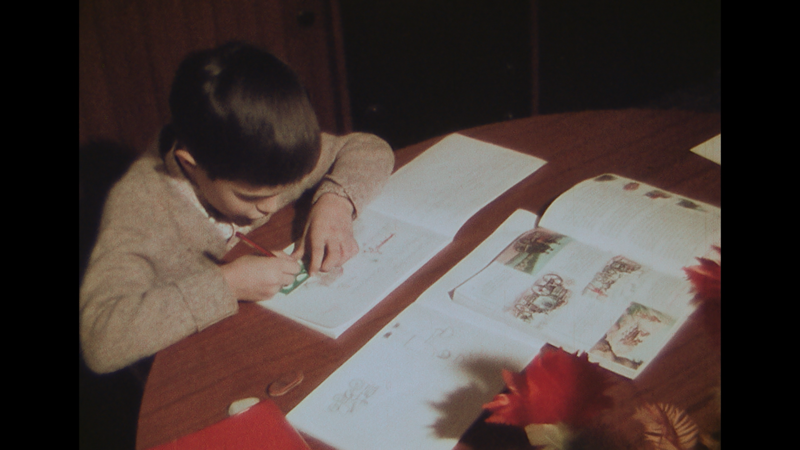 I, Nathaniel, very much enjoyed transferring this particular collection of mini-documentaries which the Rene Family filmed during their International vacations. These treasured films were very well stored, and the camera work was outstanding. Clip courtesy of Robert M Rene MD, with his expressed written consent -- All Rights Reserved. Classic all metal fire engine, in high pursuit - even amidst snowflakes! 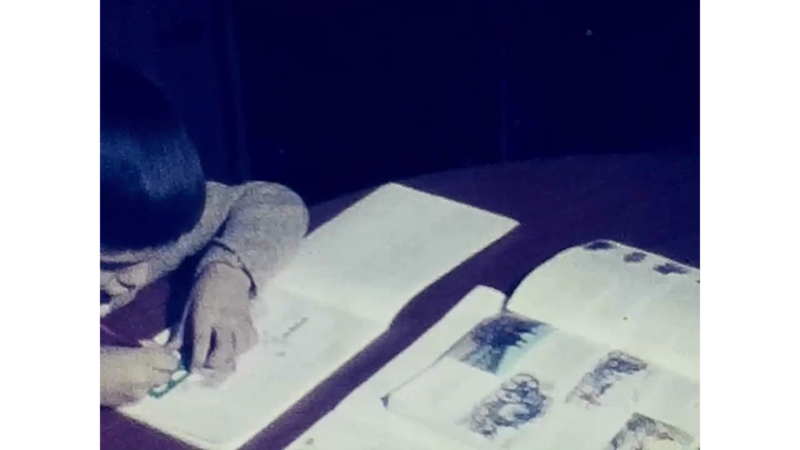 Here is 8-decade old 8mm black and white film with all its charm ... and then some. We use this clip with expressed written consent from Phil Hugly -- filmed by Lina Studer nee Dubois. All Rights Reserved. Freeport Stadium May 1958 winning driver of car 269 George Peters. Clip courtesy of Richard Girards, with expressed written consent -- All Rights Reserved. Goodness -- what is this? 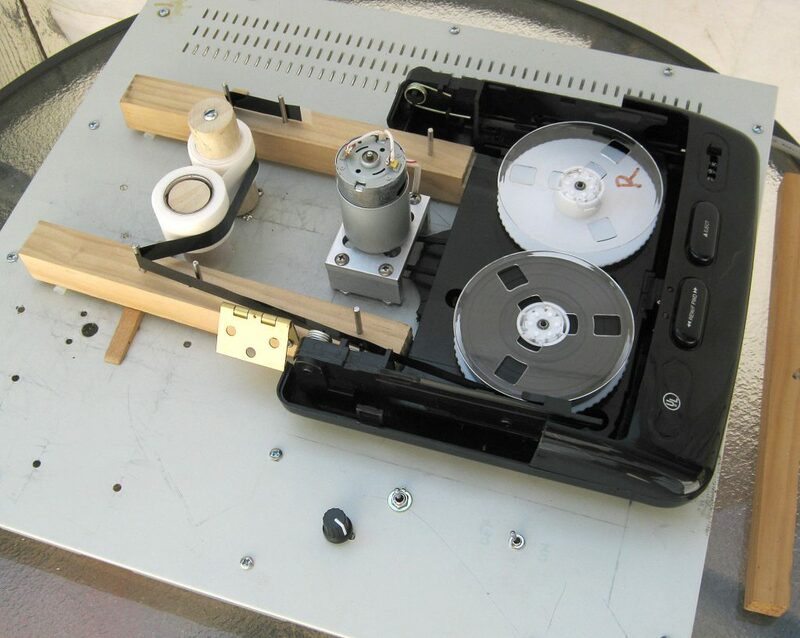 One day, we came upon the most unique 8mm film splicing technique ever used -- a staple. It sure made us laugh! 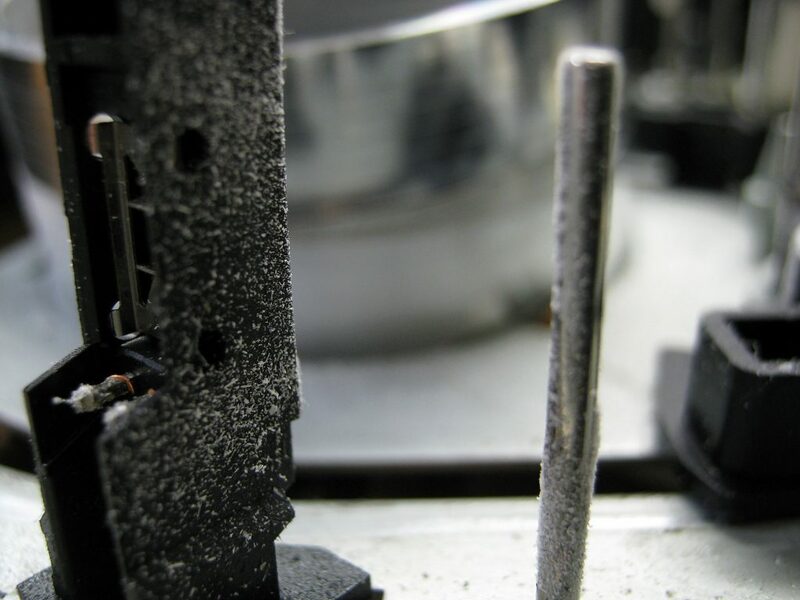 In all the years of seeing the various film splice work that our customer's have done, the use of thin metal was something that really surprised us. Hey - it worked for them in the moment but would not do in our equipment. 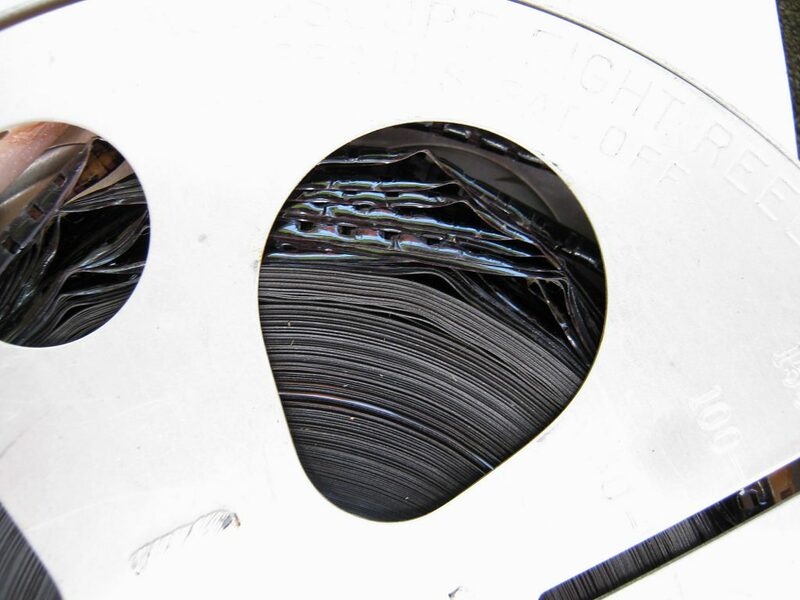 With each reel, we carefully check all splice for integrity. 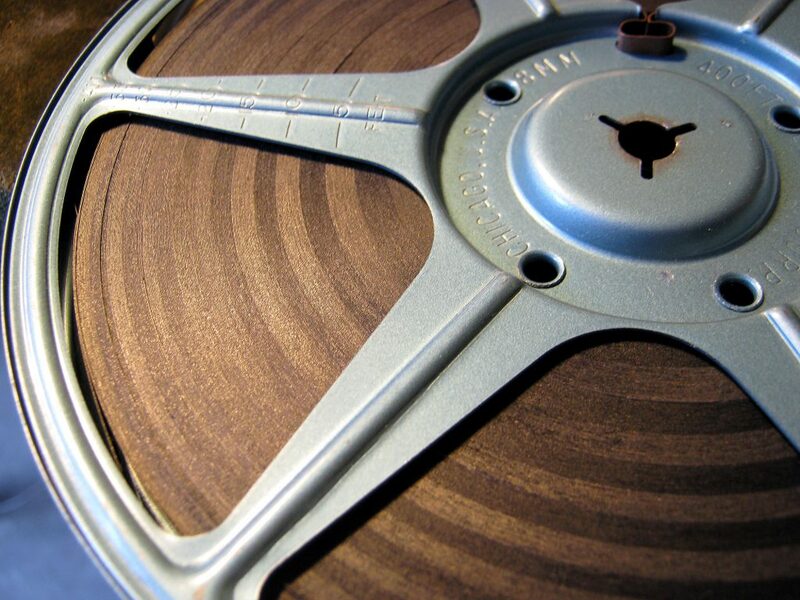 If we find them broken, weakened or exceedingly poorly done, we replace three per reel -- FREE of charge. If more splices are needed, in order to affect a nice transfer, we charge a nominal fee for additional needed repairs. Most reels don't require more than three, if that. 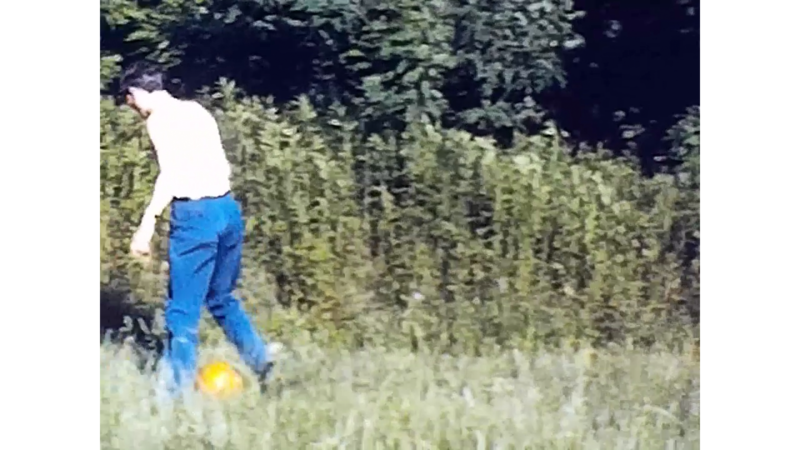 While all cherished footage that we have ever transferred is an honor to us, here at FilmFix, this is the most treasured footage we have ever digitized. It's short but very sweet, and it proves that each second of every reel is being monitored, while we preserve our customers' precious memories. These brief moments were shot on 8mm film and show Charlie Chaplin self-promoting the movie "The Kid" -- the one which brought him into the limelight and International fame. The parade took place in Switzerland, circa 1932. We assume it was that year based on the date hand-written on the film canister, even though he released the film in 1921. This must have been how he started to endear himself to the Swiss people, long before he made his final move there. Apparently, Charlie Chaplin was know to self-promote his movie by "dressing up" in his iconic Tramp outfit then joining parades. Seemingly, the parade had other characters from other motion pictures but nothing that I could definitively recognize. In this clip, do you notice how Mr. Chaplin is using a whistle in order to draw attention to himself? We think it's a brilliant way to draw eyes toward him! To explore more about Charlie Chaplin and his Swiss connection, please visit this page. Use of clip with expressed written consent from Phil Hugly -- filmed by Lina Studer nee Dubois. All Rights Reserved. What about moldy looking VHS tapes? Mold on VHS tape - or what is it? Evident crystal-like white powder looks like mold at first glance. 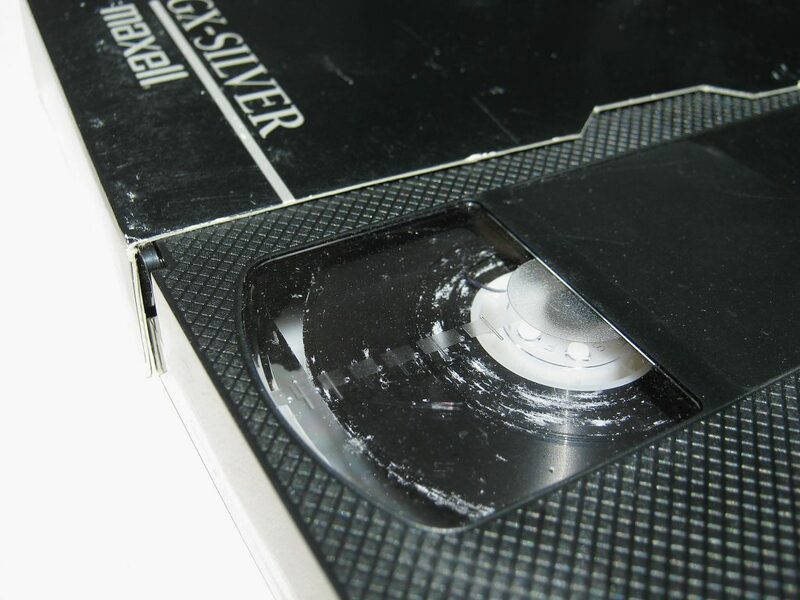 In realty it is a chemical reaction that happens as the VHS tape slowly breaks down. A tape that looks like this will not play back in your deck for very long. Soon enough, the fine, flaky powder will cover the inside of your VHS deck, and the VHS deck head which reads the tape will stop producing a clean image. You will start to see more and more dropouts, as that powder continues to build up on the head. 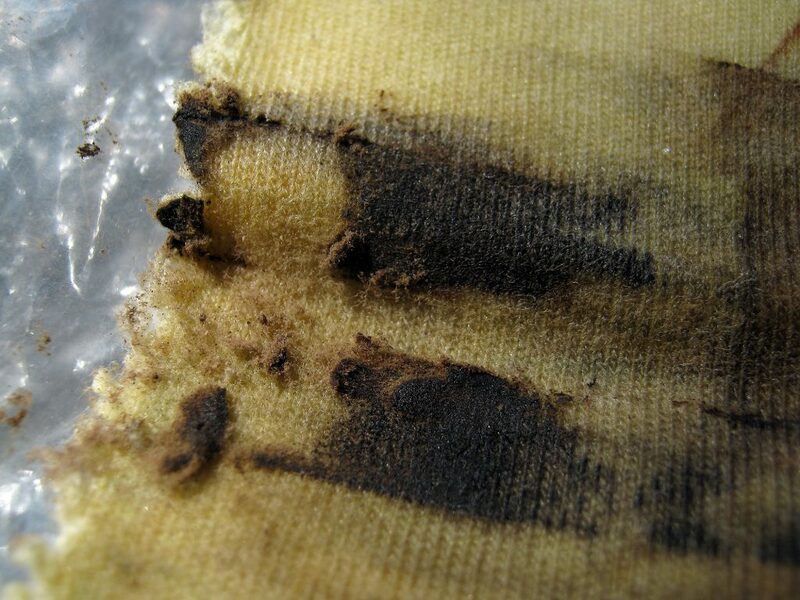 Eventually, the deck will need to be sent out for cleaning, because those long cotton swabs dipped in rubbing alcohol will only work as a "quick fix" for so long. The tapes below required a special hand-cleaning treatment before being transferred. First, the tape case is disassembled then carefully cleaned. The activity happens in a protected environment. Cleaning machine is used in a protected environment. Paper tape rolls continually get renewed as tape is cleaned. We respect your privacy. You retain the copyright of your treasured family memories! Not all companies can say that. Please check their "fine-print" to make certain they will not sell or share your personal family footage to an unknown source. Over the years, we discovered too many other companies retain copyright of your personal memories. If they retain copyright, they can use or sell your footage, as they wish. What you likely thought was a private transaction is not. We find it disturbing that unbeknownst to you, those dearest memories could end up anywhere. It was astonishing for us to discover a company who was offering their transfers at a low price, and providing low quality work too, only because they were trying to hook customers -- then sell their footage to make a large profit. We can just imagine their further motives! If privacy is as important to you as it is us, please do your homework -- then, call us. We use a telecine xenon flash scanner. Here are some of the parts of our system. Because many of you asked, we show you the type of camera we use. It's a professional JVC video camera, model GY-HM750U. What makes it distinctive is its 3CCD image sensor. Having a 3CCD sensor, and not just a CCD or CMOS sensor, is critical in capturing a true image. 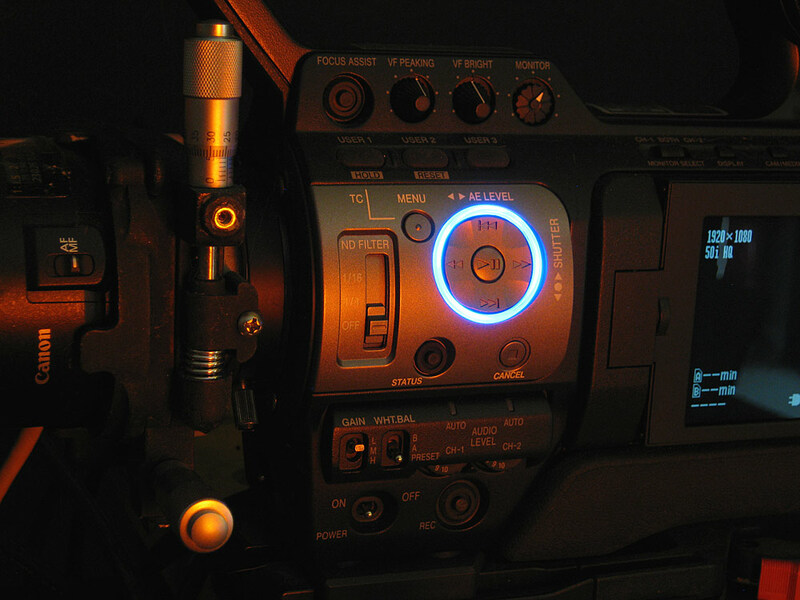 The camera provides an HD-SDI output signal, which holds the 10bit Full-HD image information. 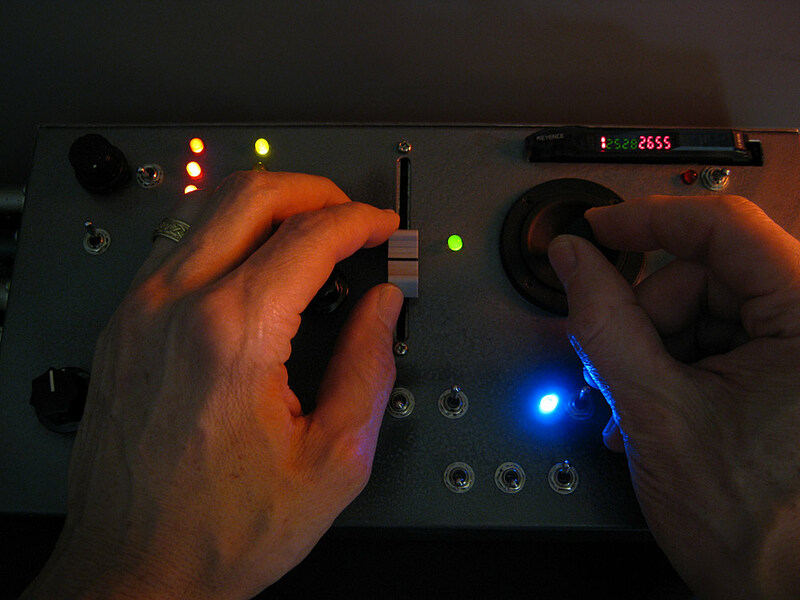 That HD-SDI signal gets captured by a computer. The extra color depth of our 10bit, over most transfer houses' 8bit, provides a more refined range for precision color-grading. The camera is pricey but worth it! 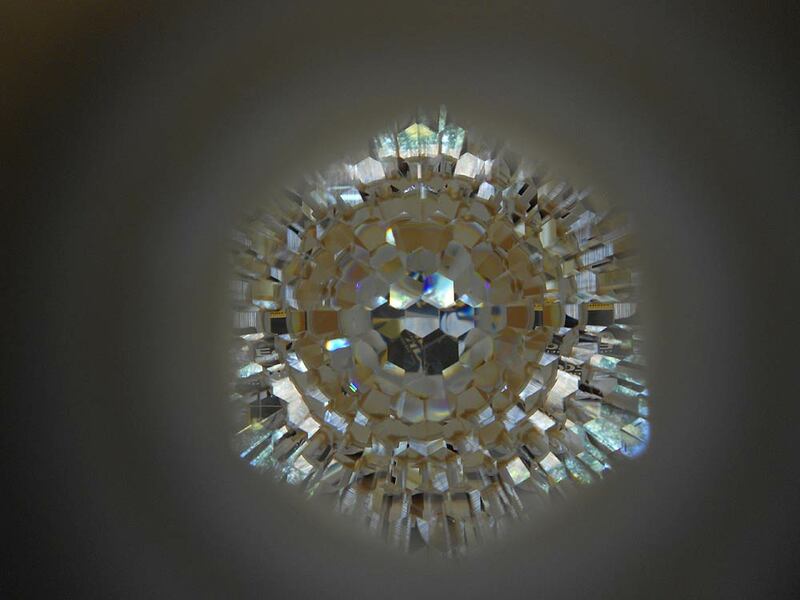 The lens we is the sharpest 60mm macro lens Canon makes. It's from their EFS series. The lens is held by a special lens holder which allows us to finely tune the image framing getting your whole image perfectly framed during our initial capture. This is the brain of our flash scanner. The box uses two 8-core microprocessors to control all the required elements of the flash scanner. 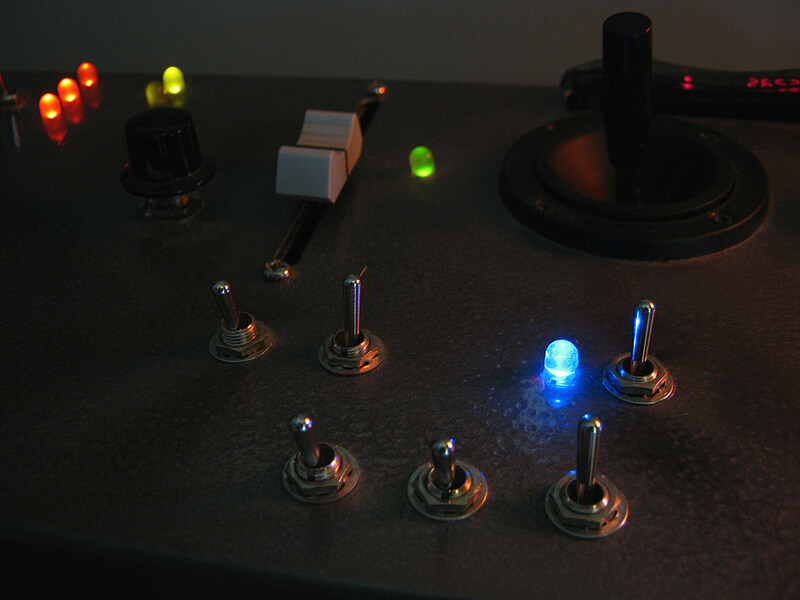 The five elements are: the motor and video signal interlock, the strobe laser interlock, the color of the light, the light intensity automation control with added manual override for fine adjustments, and the mechanical adjustment required for any varying shrinkage of the film. 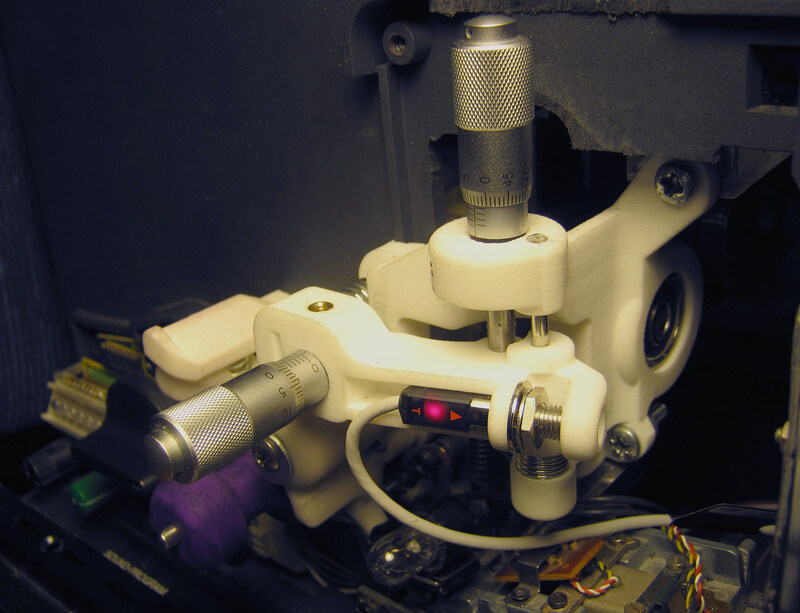 The skeleton of our scanner is a studio class Bauer projector. The robust German machine (frame) provides the films transport and a stereo duo-play sound playback. Removed from this frame were the original motor, the mechanism of the pull-down claw, the lens, and the gear wheels. 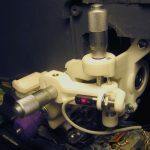 They were replaced with a new motor, new interchangeable gear wheels for 8mm and Super-8 film, a new light (a xenon light strobe with color filters and diffuser), a film density reader that pre-reads the film for any required automated exposure corrections, and a laser that reads the sprocket holes' edge for proper strobe timing. The optics for the light, includes a special encasing, color filters, IR and UV filters to protect your film from the light, light diffusers, encoders, servos, and a whole range of electronics. 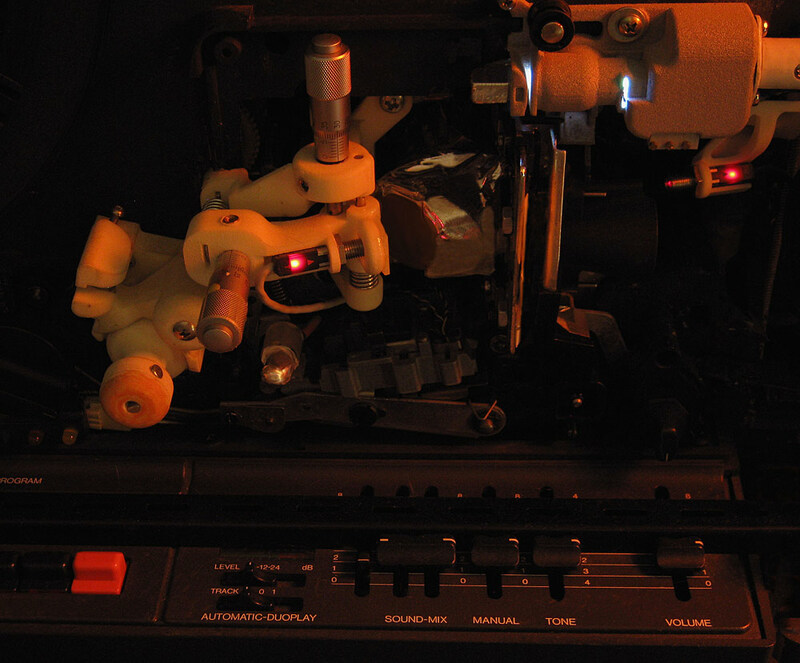 Shown here is the laser and the light of the film density reader. Many films did not have sound, but for those that did, we keep the sound interlocked to the image as your film gets scanned, frame by frame. In addition we record, in parallel, the analog sound at an extreme high sample rate of 192kHz. This recording replaces the camera's inferior sample rate sound. This extra step allows for a true 48kHz sound rate, even after we do our final slowing down for playback at proper speed. Manual light adjustments during transfer allow for a more fine-tuned capture. 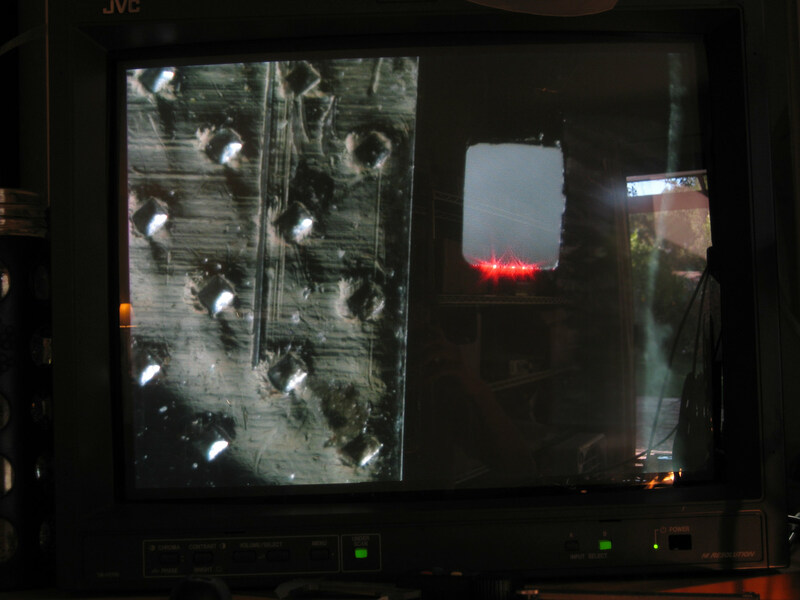 Laser reading edge of Super-8 film sprocket hole. We don't use substandard, non-professional equipment. If you are intent on transferring the film yourself, you may have considered using one of the inexpensive models appearing on the market several years ago. It is wise not to expect decent results from these, and be prepared to invest a inordinate amount of time for each reel. May we boast for a moment? Our work is clearly superior to those DIY transfers for several reasons. 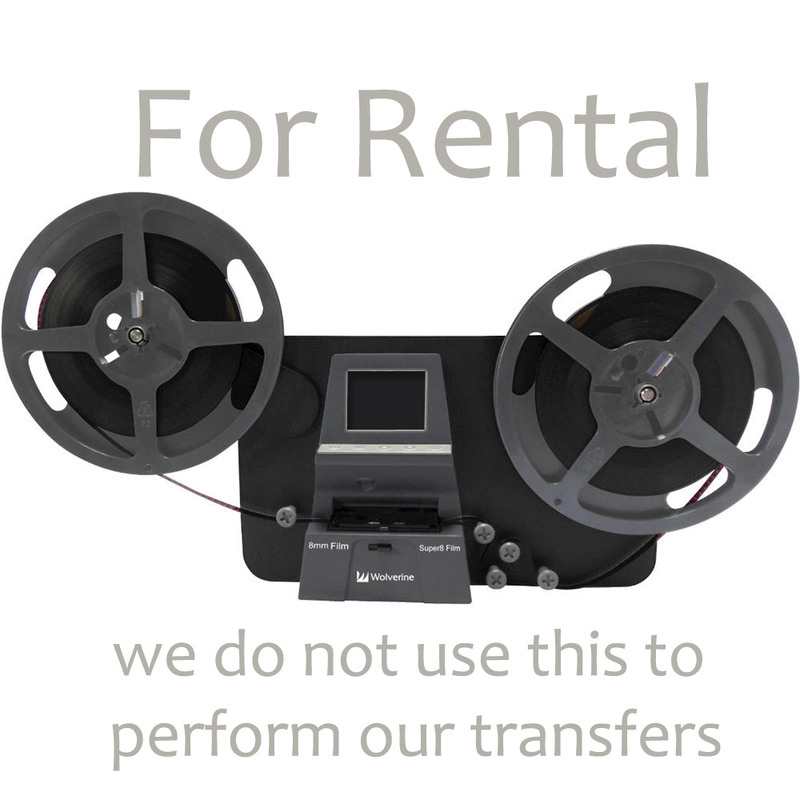 (Send us a small free, 3" Test-Transfer reel -- we often run a special. Look for details on our website.) Also, those machines will not capture sound, if your film happens to have a sound strip. However, we will capture it -- at no extra cost! The sweet voices get perfectly interlocked and synced up with the film's image. Will rusty reels harm my film? 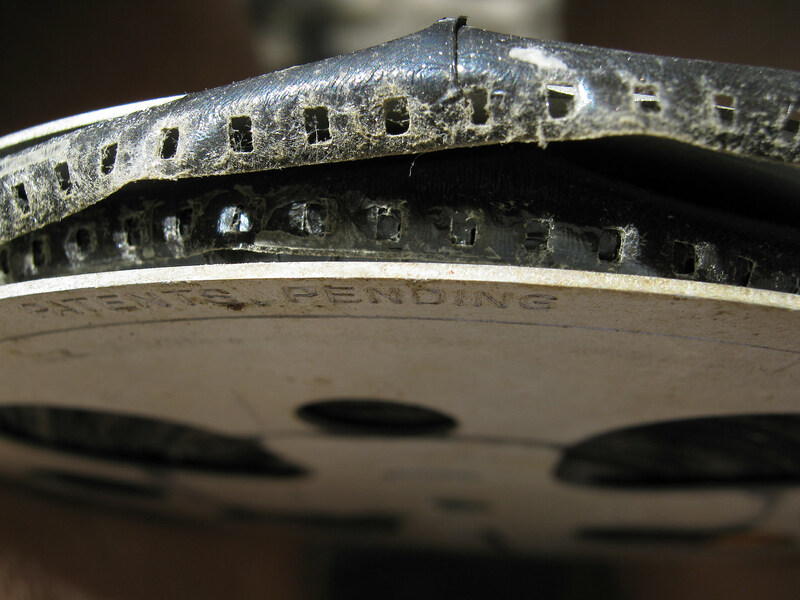 Rusty reels have a detrimental effect on the film. 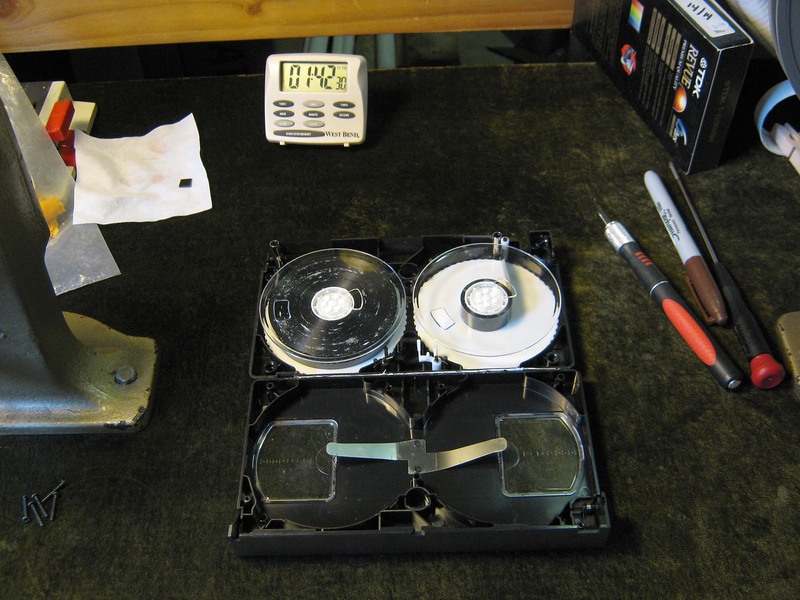 Time can be very hard on old metal film reels. 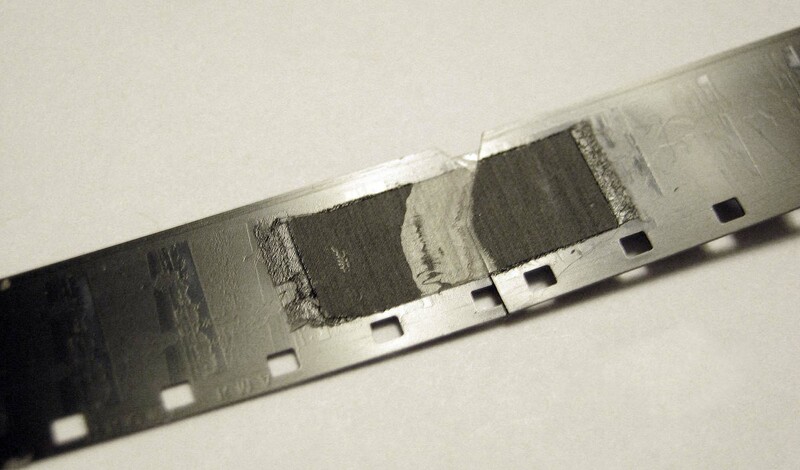 It accelerates the decay of the films as it reacts with the film's silver. 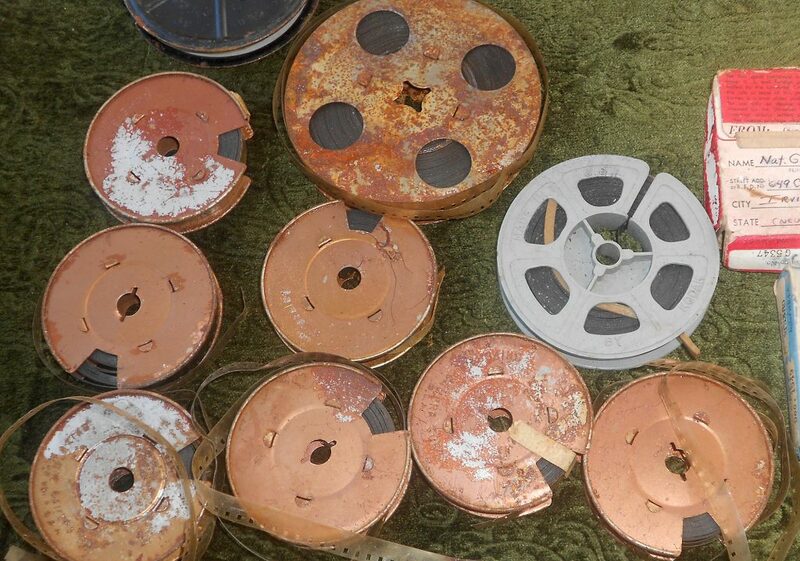 Film archival houses won't even let rusty reels be stored at their facilities. 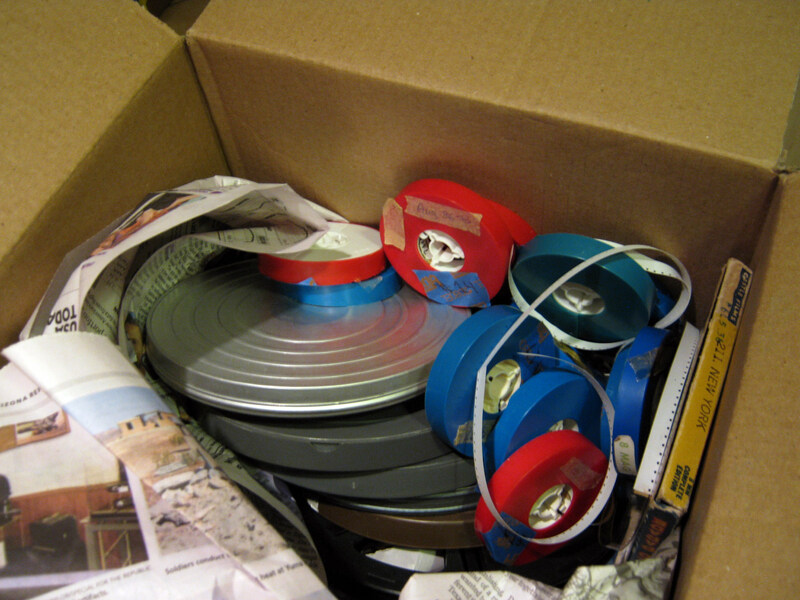 It is high-time to get these films first moved onto plastic reels, and then see what sort of needs they have. Conditioning the film will be a crucial second step, before a transfer is attempted. We carefully hand-clean your film. After inspecting your films, we begin by asking ourselves, "What will benefit this film the most?" 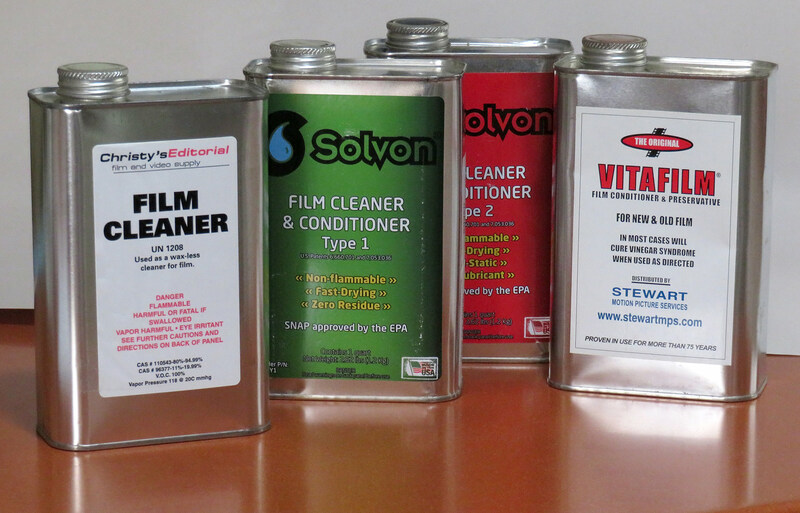 The professional brands we use to clean your film are: "VitaFilm", 2 types of "Solvon", Christy's film cleaner, and "FilmRenew." In our 13 years of experience, we have noted that all films benefit from cleaning -- even films coming straight from the lab! Many films do not require extra special care -- a careful hand-cleaning will do. Other films, though rare, require a pricey film solution called "FilmRenew" (not shown here.) To note: We never use "VitaFilm" to clean film that has been spliced using tape, because it dissolves the tape. We have excellent cleaning practices: We start with clean hands (thus the gloves), clean surfaces, and cleaning cloths that are fresh. These things make an important difference. Below, the film was quite dirty, but with a careful hand cleaning, we achieved very nice results. 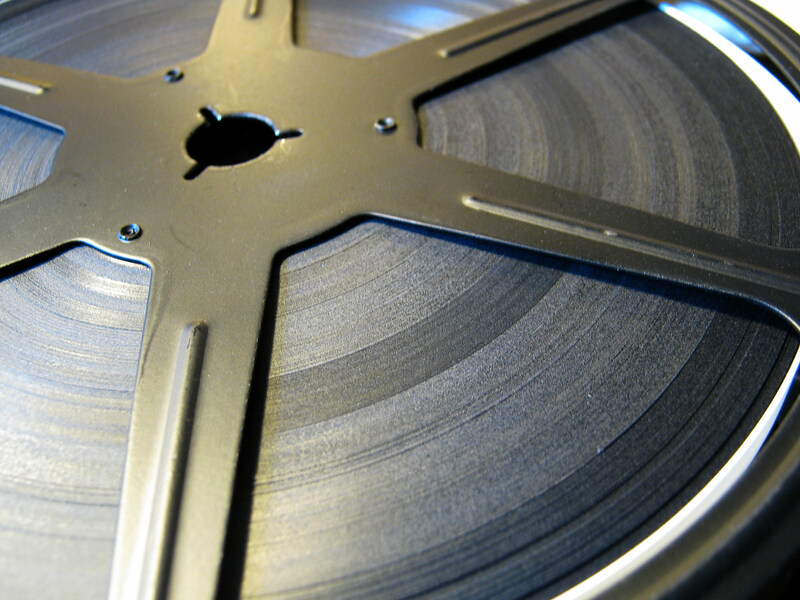 Sometimes dirt will get securely embedded into the film's emulsion. In certain cases, some of that dirt will remain. Still, plenty will be cleaned off. Careful hand-cleaning is part of a successful film transfer. Here, there was some mold with the addition of tar built up on the film. We speculate that the owner was a smoker and enjoyed their cigarettes, or perhaps cigars, while watching their treasured family memories. 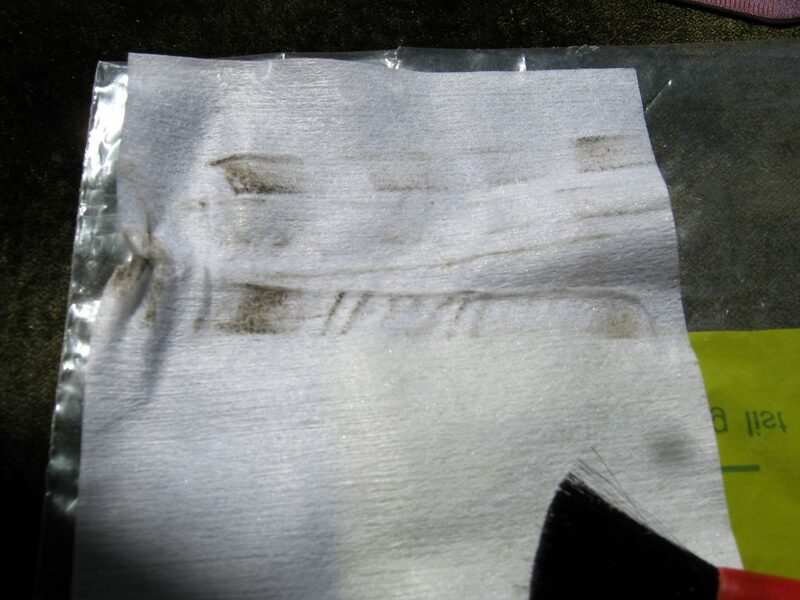 Dirt and smoke, in the air, can cause a considerable build up of residue on the film. One of these reels is not an 8mm film. It's 16mm leader. The fourth reel from the left is quite an odd sight to see. That's because it's a leader of 16mm film - cut in half. This is something that was sometimes done with double perforated 16mm leader but never with regular perforated leader. The leader cannot be projected as it is, because every second perforation hole is missing. Is it normal 8 or super-8 film? 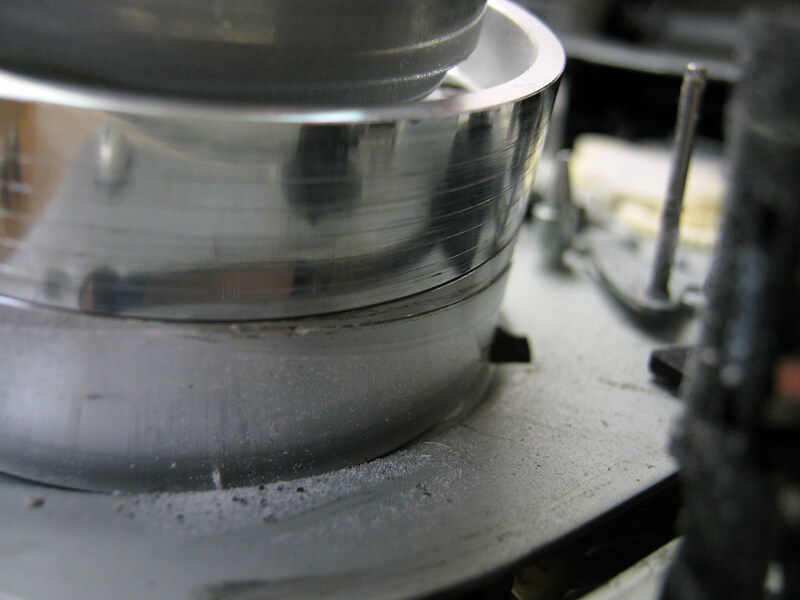 Without looking at the reel's center hole, one can already determine what kind of film is wound onto each of these two reels, below. It's a sort of geeky puzzle to solve, but this is just my kind of thing. 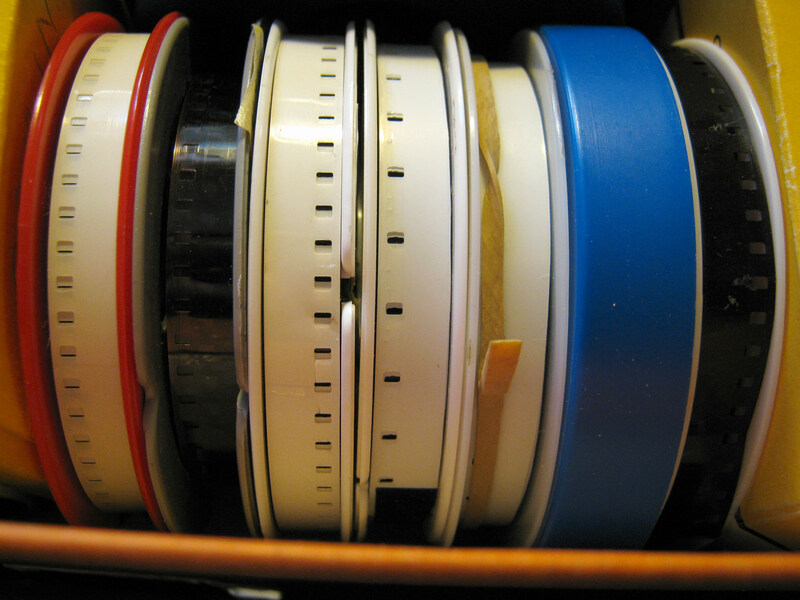 Try to figure it out which is Normal 8mm film and which reel is Super 8mm film.